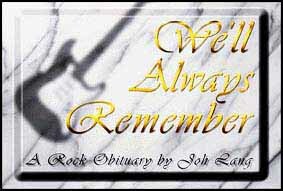 We'll Always Remember a Rock Obituary and Tribute website. This site is the love child of fans just like you who want nothing more than a place to gather and pay our respects to the men and women who entertained and inspired millions around the world. Jimi Hendrix, Buddy Holly, Rory Gallagher, Phil Lynott, Freddie Mercury, Jim Morrison, Elvis Presley, Rick Nelson, Janis Joplin, Karen Carpenter, Kurt Cobain, John Lennon, Lynyrd Skynyrd, Mick Ronson, Ritchie Valens, Tupac Shakur, Notorious B.I.G., Sandy Danny, Mark Bolan, Andy Gibb, Roy Buchanan, Steve Gilpin, Selena, Wong Ka Kui , Shannon Hoon, Andrew Wood, Brian Connoly, Sid Vicious, Mama Cass Elliot, Ray Gillen, Frank Zappa, Tony Williams The Platters, Jim Croce, Bill Haley, Eddie Cochran, David Box, The Big Bopper, Stevie Ray Vaughan, Jeff and Tim Buckley, John Denver, Rhett Forrester, Michael Hutchence, Carl Perkins, Jerry Garcia, Frank Sinatra, Brian Jones, Bradley Nowell, Cozy Powell, Randy Rhoads,Marc Hunter, Roy Orbison, Bob Marley, Wendy O Williams the Plasmatics, Tim Kelly Slaughter, Criss Oliva Savatage, Alex & Les Harvey, Cozy Powell,Cliff Burton, Nick Drake. Who are some of the Stars featured, and no longer with us.